Thanksgiving season is over and now it’s Christmas time. I love Christmas season because of all of the holiday flavors. My favorite it peppermint. Yum! I can’t get enough of it. 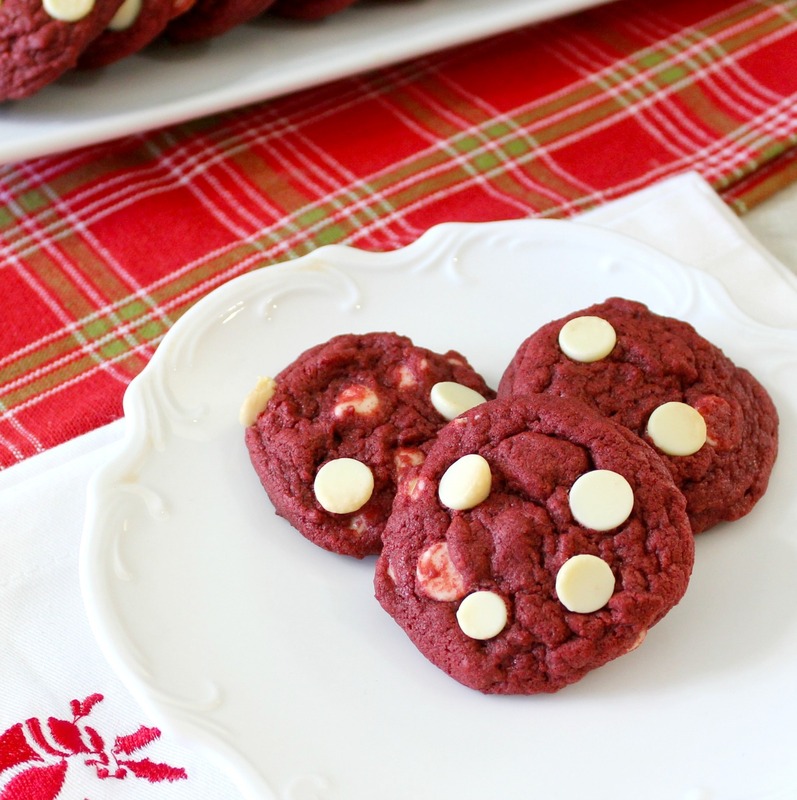 Today’s recipe is not peppermint, but it is definitely a cookie that you can add to your Christmas cookie platter. 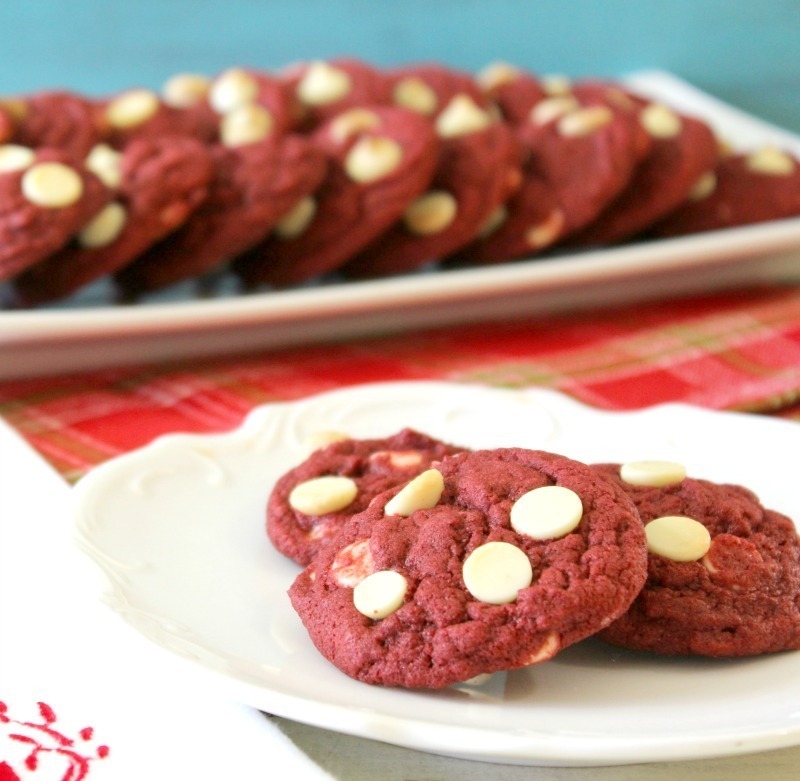 It is a festive red cookie with little pops of white that looks like little snowflakes. 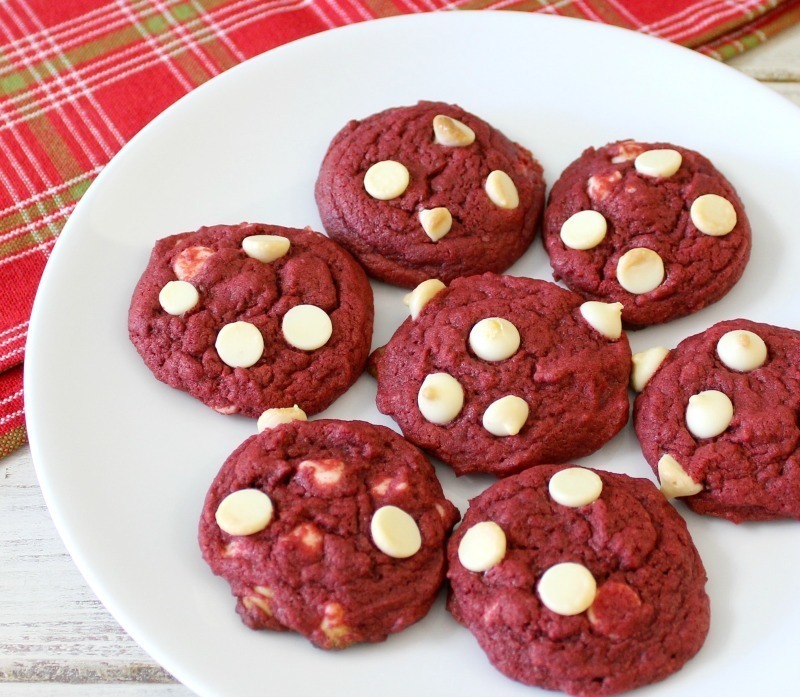 It is my Red Velvet Cookies. 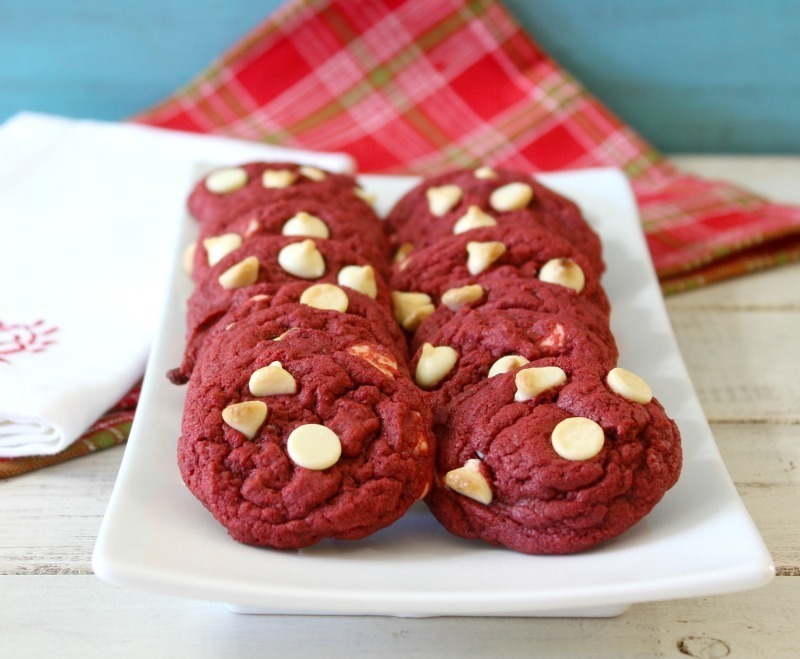 These Red Velvet Cookies are chewy, a little crunchy and have the perfect red velvet flavor. You get a nice hint of chocolate and the white chocolate chips is absolutely the best chip to use in these cookies. 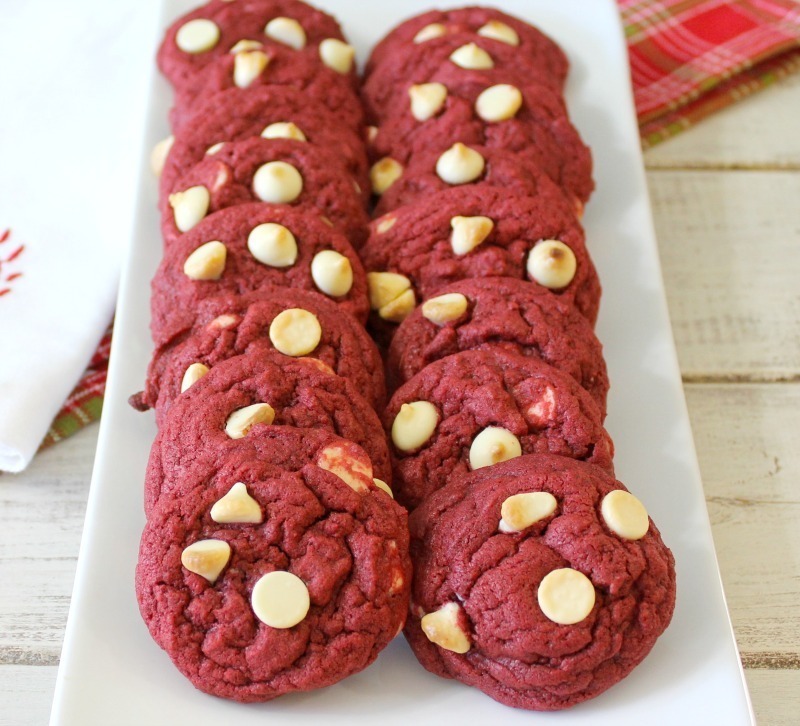 If you love red velvet you will just love these cookies. When I did a search for these cookies I found most people use cake mix. I didn’t want to do that, for one, I didn’t have any, two, it’s so much better when you make it homemade. Take the extra time to make them from scratch. It’s a breeze to make. The recipe is pretty basic. It’s almost the same recipe as classic chocolate chips with a few added ingredients that just about every household has, cornstarch and vinegar. I found this recipe from The Sweet Life. She adapted the recipe, and I adapted her recipe. Funny how everyone can change-up a recipe and make it their own. I think my adaption made them perfect. What I do like about this recipe is that you don’t have to chill the dough. I hate when I want to make cookies now and then the recipe says to chill the dough for a few hours or overnight. Sheesh, when I want cookies, I want cookies now. You know what I am talking about. To make these cookies really fly you could add cream cheese frosting. I debated carefully about that. The only thing is, when you make cream cheese frosting the cookies need to be refrigerated. I’m not a fan of refrigerated cookies. it just seems to dry out the cookie. However, frozen cookies, heck yeah! 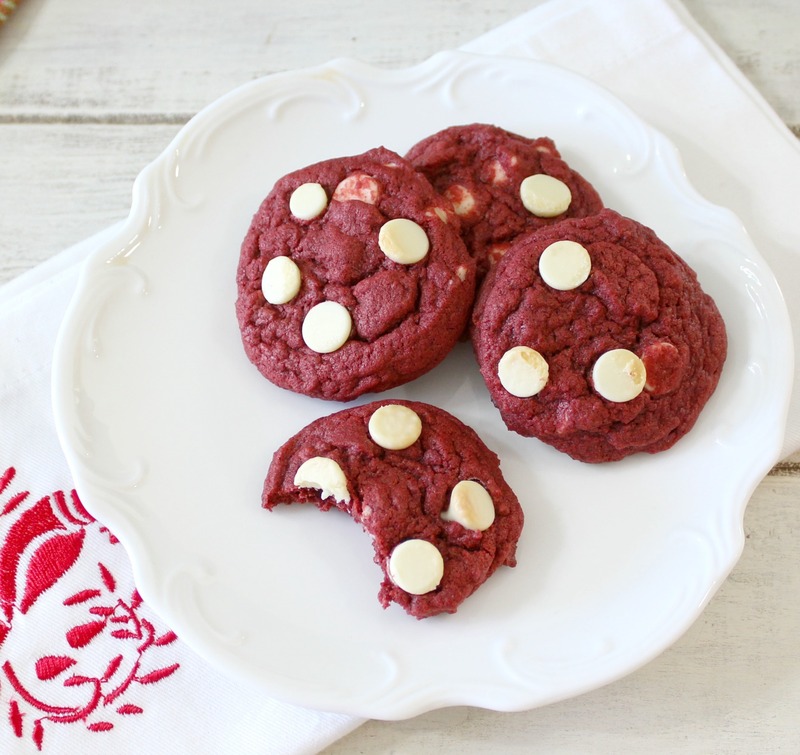 I love a frozen cookie and these cookies will freeze great. Make them now and bring them out on Christmas. I just let them come to room temperature. What is your favorite holiday cookie? I have so many. I just love cookies. They are one of my favorite things to make and eat. A little indulgence, but not a sweet overload. 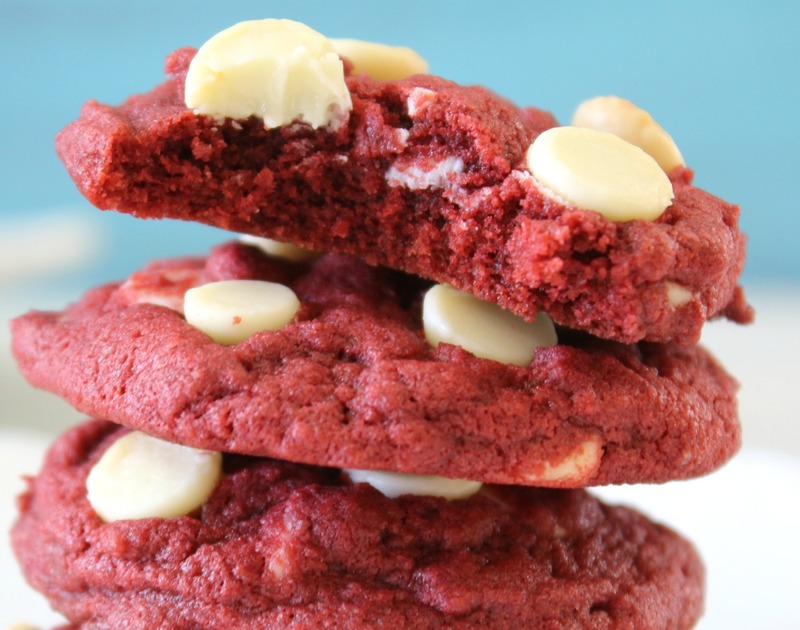 When you take a bite of the Red Velvet cookies, you get morsel of white chocolate with that nice little crunch and a soft center. When you bake the cookies, and when you add a few white chocolate chips to the cookie dough, turn the chips upside down, so the top of the chocolate doesn’t burn. Otherwise you may get a light brown color to the tip of the white chocolate chips. 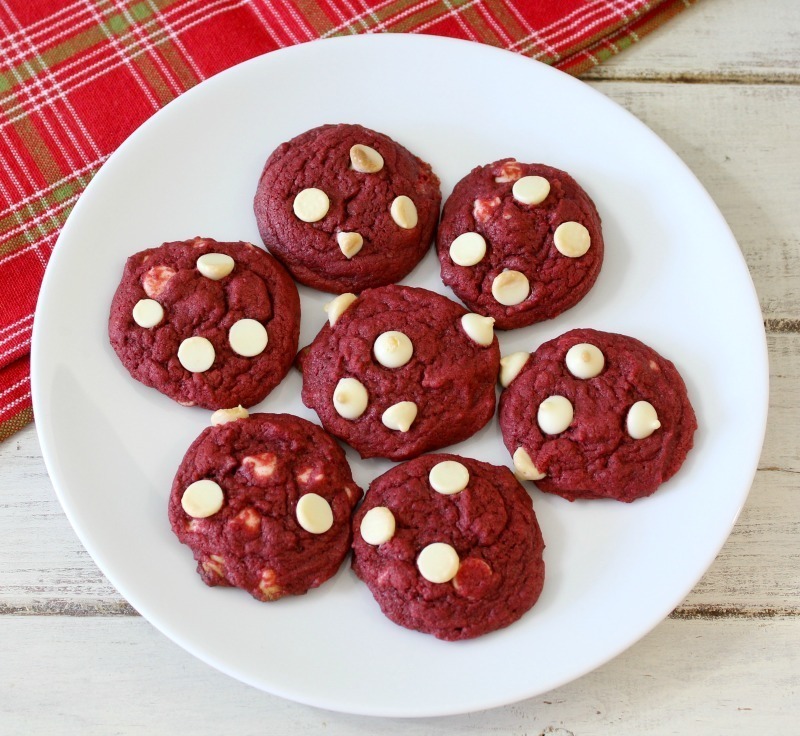 A chewy red colored cookie with crispy edges, a hint of chocolate with morsels of white chocolate chips. 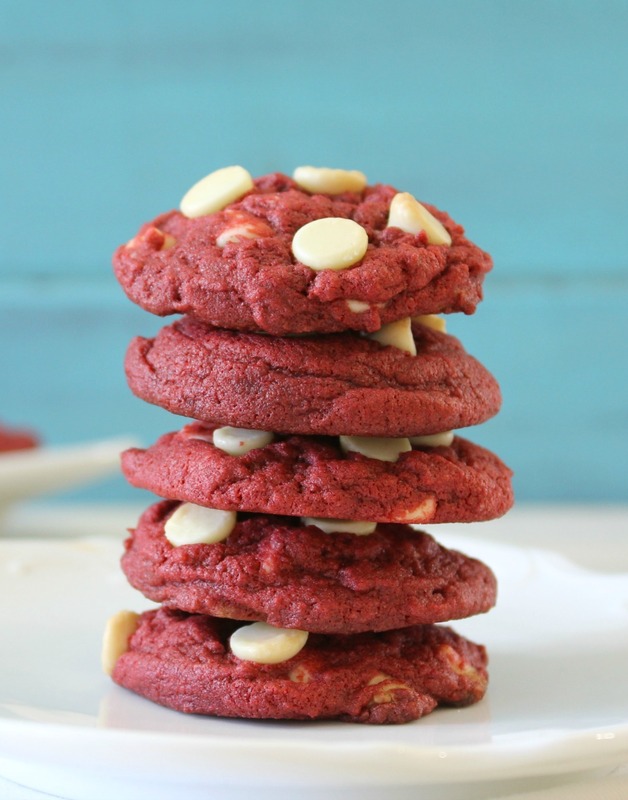 The perfect Red Velvet flavored cookie. In a medium bowl; add flour, cocoa powder, cornstarch, baking soda and salt. Mix until combined; set a side. In a large bowl; beat together butter, granulated sugar and brown sugar until light and fluffy; about 3 minutes. Add egg and egg yolk, beat until combined. Add vinegar, vanilla extract and food coloring; beat until combined. Carefully add flour mixture and beat just until combined. Fold in 1 cup white chocolate chips. Bake in oven for 8 - 9 minutes, just until lightly golden. Take cookies out of oven and let them rest for 2 minutes on baking sheet, then place on cooling rack to cool completely. In between baking each batch, chill the cookie dough in the refrigerator. Adapted from The Sweet Life. I cannot wait to start the holiday baking. So many things I want to do, but not enough time. I wish I could take the month of December off at work.